BOURBON! Hope that go t your attention. Y’all, this bourbon glazed salmon dish is straight up heavenly. I’m so excited to share it! Sean and I love it so much that it was our choice for dinner on a recent Monday night. This wasn’t just any ol’ Monday – it was December 8th – our wedding anniversary. We went out in Tulsa for dinner the Saturday night before to celebrate, but for the actual night it seemed fitting to cook a nice dinner at home. The combination of flavors leaves you wanting more: the sweetness of the brown sugar, sharpness from the soy sauce, the tangy spark to your tastebuds from the lime juice, the shy little heat from the pepper, and the not-so-shy burst of bourbon…ohhh that bourbon. It provides an amusing punch to the sauce that brings the whole thing together. 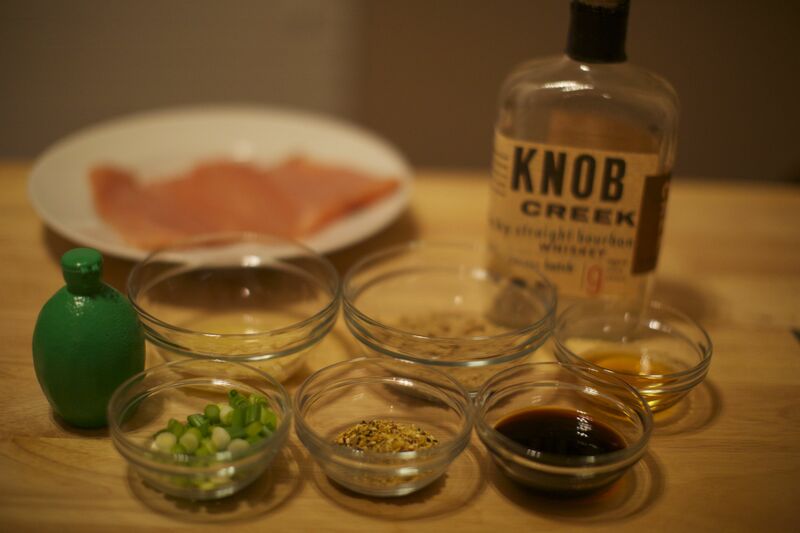 Once you’ve got your mis en place (everything in it’s place – ingredients ready for action!) ready, it’s crazy easy from here on out. 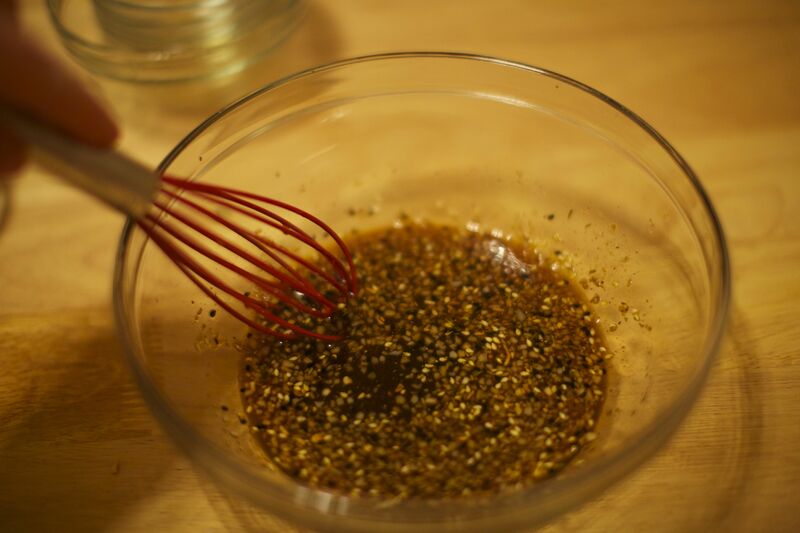 Mix brown sugar, soy sauce, bourbon, garlic, lime juice, ginger mixture, and black pepper all together in a bowl. Well that was easy! Give the liquid mixture a little taste…and I mean little…but beware of the hearty punch to your senses from the bourbon! A little goes a long way, and it cooks out…trust me. It’s the perfect amount when the dish all comes together. 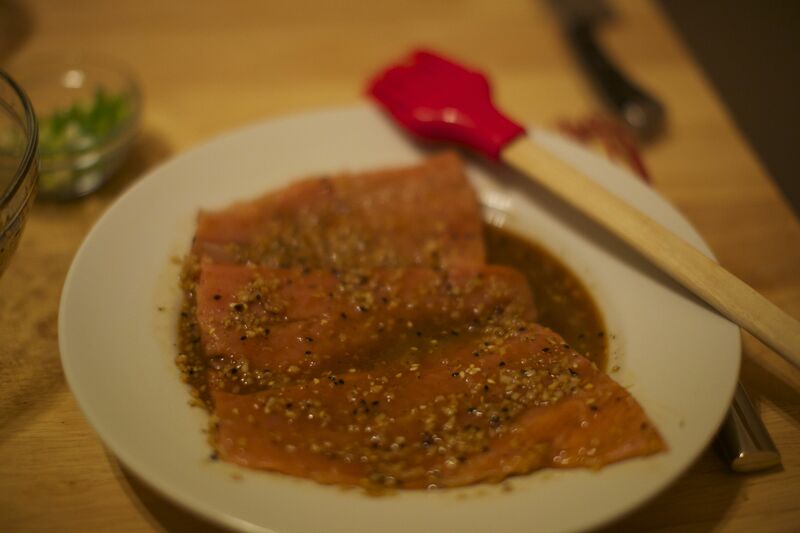 Lightly salt the salmon, then pour just half of the mixture over the salmon filets, resting patiently on a plate. Place the plate in the fridge to chill until you’re ready to cook. No longer than an hour in advance. 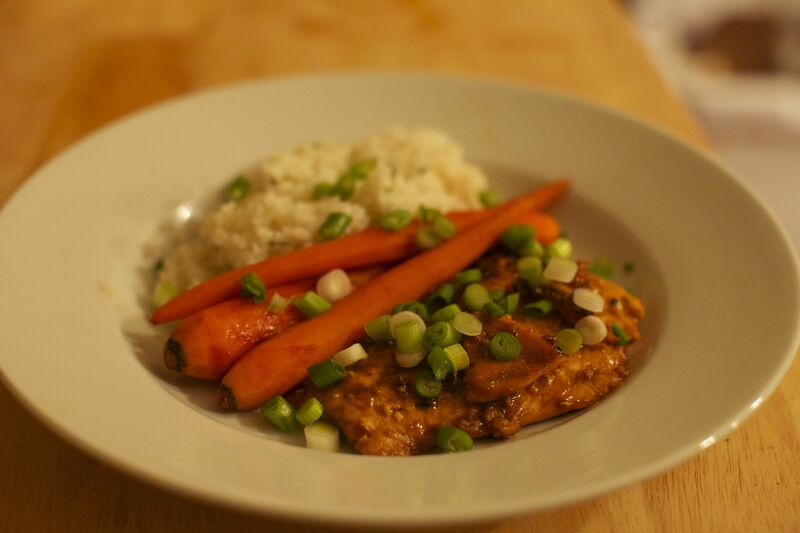 When I cooked this, it was about 20/30 minutes early while I waited for Sean to come home and worked on desert. While that chills, Step 3 is really all about the other stuff (took everything in my not to say “all about that bass”…but I stayed strong!) like…oh I don’t know…pouring yourself a hella good glass of red wine? YEAH! Quick pause from the recipe to talk about this red blend. Ghost Pines‘ red blend came recommended by a staff member of our neighborhood liquor store, Kwenchers, which has quickly become our favorite place to get wine/beer/scotch (Sean’s a scotchy-scotch guy). I asked for “a nice red blend” and mentioned I usually love Apothic but wanted to try something different for our anniversary dinner. Kwenchers certainly knows good wine, because this recommendation was perfect. As I started to prepare dessert in advance, I took a sip…and it was like a Zack Morris style “time out” where the world stopped for a moment and let me savor its beautiful balance. Anyone else like a good red blend like me? It’s a medium bodied red, similar to Apothic, but slightly less sweet with a dryer finish. It’s absolutely perfect for this kind of dish. Just had to share! Sides! Most any sides will do. I just threw together some small whole carrots and white rice. For the carrots, I sautéed them in a bit of a random mixure (but a personal favorite) of chicken broth and pumpkin pie spice. SUPER random sounding, right? But try it. Juuuuuuuuust try it 🙂 Be sure to let it simmer and roll around in the broth while covered. It’s our favorite easy way to cook carrots while also giving it a hint of spice. Nothing too fancy with the white rice. I always add a little butter, salt, and pepper to taste, then finish it with a little chopped parsley mixed in. Cook the salmon in the pan for just a few minutes each side, depending on how thick your slices are. Our’s were thawed from frozen and on the thinner side, so about 3 to 4 minutes on one side, flip carefully, and 2 to 3 minutes on the other did the trick. After you flip the salmon, add the remaining glaze that you set aside originally and let it all come together just before it’s perfectly cooked; soaking in the fresh flavors at the last 2-3 minutes. Sprinkle some chopped green onions over the dish (or a lot…like we did!) and ENJOY! I can’t wait to make this again. It’s a perfectly divine, perfectly easy recipe to make any night of the week. It was a classy compliment to our special night. 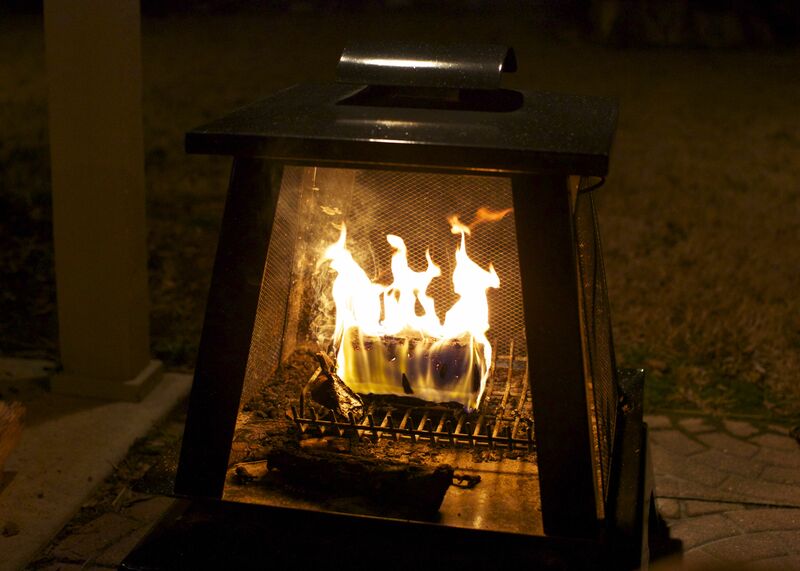 After dinner we decided to join the chilly Oklahoma evening outside for a fire in our fire pit. Jackets on, drinks refreshed, and a perfect night by the fire to laugh hysterically and catch up on life with my best friend, love of my life – my dear hubby. Love you so much, Sean. Enjoy this dish for a special night, or for any ol’ day. We adore it. Hope you do too!